An election official prepares the ballots during local elections in Istanbul, March 31, 2019. The ruling Justice and Development Party (AK Party) seeks to redo the March 31 elections in Istanbul after the provisional results saw countless irregularities and possible intentional errors in the counting system. "We will use our right to extraordinary objection. There are numerous events and situations that could affect the election's results. We will demand a repeat of the election," AK Party Deputy Chairman Ali İhsan Yavuz, who is responsible for election affairs, said yesterday in a press briefing. Referring to the decision by the Supreme Election Council (YSK), Yavuz noted that the YSK's decision is incomprehensible in light of the documented presence of numerous irregularities and errors. "There is no meaning in recounting only 51 ballot boxes," he added, underscoring that the evaluation process has not come to an end yet. The comments came after the YSK decided on Monday to recount the valid votes of 51 ballot boxes in 21 districts of Istanbul, partially rejecting an appeal to recount all votes in the most populous city in the country. According to the decision by the YSK, 51 ballot boxes were identified with empty tabulated results or tabulated results without a signature. As ballot boxes generally include approximately 300 to 350 voting papers, 15,000 voting papers are expected to be recounted by officials of the YSK. The call to redo the election also received support from the AK Party's ally in the elections, the Nationalist Movement Party (MHP). MHP Chairman Devlet Bahçeli noted yesterday that such claims and disorder in Istanbul's elections should be resolved through democracy. "[If the elections] resulted in a way that does not satisfy the public conscience, holding a new election may be considered," Bahçeli said. 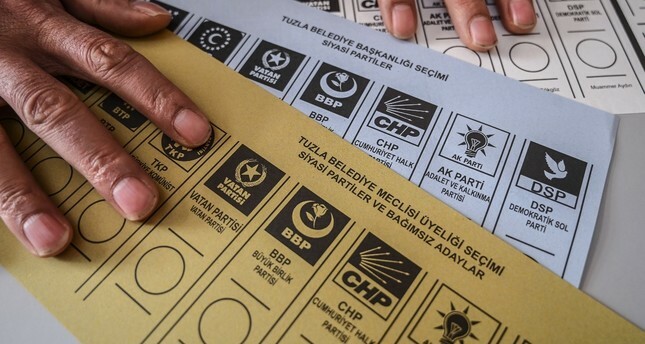 In the upcoming period, after the three-day period, where the political parties can file objections against the decision of the provincial election boards to the YSK, finalized on April 10, the council will have three days to evaluate the objections and decide on April 13. If a conclusion cannot be reached at the end of this regular process, the extraordinary objections process comes into play. In this process, in line with Article 130 of Law No. 298, parties can appeal the rejection decision of the YSK. Should the parties document irregularities and errors of facts done everywhere in the elections with tangible evidence, the YSK may decide to redo the elections, even if the mayoral candidate of the said election district was awarded the certificate of election. Provisional results indicate main opposition Republican People's Party (CHP) candidate Ekrem İmamoğlu is leading in the mayoral race in the Istanbul Metropolitan Municipality against AK Party candidate Binali Yıldırım, who was deemed the favorite by many in the race ahead of the elections, by a small margin of about 22,000 votes. There were 10,570,939 eligible voters in Istanbul, and voter turnout was 83.88 percent. However, out of nearly 9 million voters, 319,540 votes were labeled invalid, mainly in districts considered AK Party strongholds. Additionally, there were significant discrepancies among the tabulated results with wet signatures and stamps, which show the first vote record, the final record and the total number of votes submitted to the YSK. There also have been reports of irregularities and unregistered votes by the parties. As a result, the AK Party previously applied for the assessment of invalid votes and for the recount of votes in a certain district due to detected discrepancies and irregularities in data registered to the YSK. Following the results, the difference between the two mayoral candidates was reduced from 22,000 to 15,000. Addressing reporters, Interior Minister Süleyman Soylu also said that possible evidence of cheating and misconduct has surfaced, referring to the irregularities in the district of Büyükçekmece. He also added that a do-over election in Istanbul is necessary to clear up any suspicions. Commenting on the remarks by AK Party officials, İmamoğlu expressed his faith in the YSK as an authority yesterday. He also called for the YSK to finalize its decision by Sunday evening, saying that this long process only harms the Istanbul Municipality. On the other hand, Istanbul's Büyükçekmece district also has come to the fore with allegations that 11,186 people moved their addresses to the district before the March 31 local elections. Following the allegations, police launched an operation Tuesday morning to investigate such claims. Reportedly, police started going door to door, checking whether these registered voters really resided in the district. President Recep Tayyip Erdoğan raised concerns about "organized interference" in the Istanbul elections earlier Monday. "We, as a political party, have detected organized crime and some organized activities," Erdoğan told reporters ahead of his departure from Istanbul for Moscow. Yavuz also said that they would file a criminal complaint as part of their legal efforts to address such irregularities in Büyükçekmece.